Clinical signs vary depending on whether the dog has left- or right-sided heart failure. The most common symptoms of congestive heart failure are decreased stamina, coughing or difficulty breathing. What is the difference in the signs? Right-sided congestive heart failure (RS-CHF) causes poor venous return to the heart. In other words, when the heart contracts or “pumps”, instead of the right ventricle pushing the blood through the lungs for oxygenation, some leaks through the tricuspid valve (the valve between the right atrium and right ventricle) back into the right atrium. This blood backs up into the systemic circulation (the main circulation of the body) and consequently becomes “congested”. Fluid accumulates in the abdomen, interfering with the function of the organs in these areas. The abdomen may fill with fluid, a condition called ascites. Fluid may also leak from veins in the limbs, causing swelling, known as peripheral edema. In left-sided congestive heart failure (LS-CHF), when the heart contracts or pumps, instead of the left ventricle pushing the blood into the systemic circulation, some leaks through the mitral valve back into the left atrium and then it backs up into the lungs. Fluid then seeps into the lung tissue resulting in pulmonary edema. This causes coughing and difficulty breathing. Left-sided congestive heart failure (LS-CHF) is the most common form of congestive heart failure. The classic signs of heart failure – coughing and fluid in the chest – are most commonly caused by LS-CHF. Is CHF due mainly to heart valve disease? CHF is most commonly caused by valvular insufficiency. It is estimated that 80% of the canine CHF cases are caused by MVI. However, there are many other causes. Disease of the heart muscle (cardiomyopathy), irregularities of rhythm and narrowing of some of the major blood vessels can also cause CHF. Initially, MVI results in LS-CHF. If left untreated, the heart failure may progress to involve both sides of the heart. What clinical signs should I expect? The most common clinical sign of congestive heart failure (CHF) is persistent coughing accompanied by difficulty breathing. This is due mainly to pulmonary edema or the accumulation of fluid in the lungs. The enlarged heart will also push against the trachea, causing irritation that can induce a cough. Many dogs with CHF will fatigue more easily, have reduced stamina and not engage in playing or walking as they once did. Coughing when at rest or sleeping, excessive panting, persistent loss of appetite, a swollen belly, and pale or bluish gums are also signs associated with heart failure. The dog will develop generalized weight loss and muscle wasting due to the effects of CHF on other body systems. If any of these signs develop in a pet with a heart murmur, notify your veterinarian immediately. Do dogs have heart attacks? In humans a “heart attack” usually refers to myocardial infarction (MI). Myocardial infarction refers to death of the cells in an area of the heart muscle or myocardium. Cell death is usually due to oxygen deprivation caused by obstruction of the coronary blood vessels that supply blood to the heart muscles. “Heart attacks” are rare in dogs but unexpected and sudden death in dogs diagnosed with any form of heart disease is possible. Auscultation or listening to the heart with a stethoscope is the first step in diagnosing heart disease. Heart murmurs are detected by auscultation; the murmur’s location and intensity helps determine its significance. The heart rhythm is assessed, and if there are concerns, the veterinarian may simultaneously palpate or feel the pulse to determine its strength and rhythm. Finally, the lungs are assessed, looking for evidence of changes associated with heart failure. Blood and urine tests are performed to give an indication of any other disorders in the body. Liver and kidney function are often impaired in patients with heart disease. An electrocardiogram (ECG) measures the electrical activity of the heart and allows accurate determination of both heart rate and rhythm. Any abnormal rhythms (arrhythmias or dysrhythmias) can be detected and evaluated. 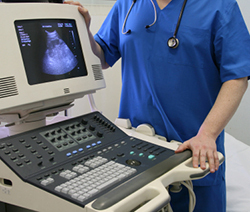 Ultrasound examination (echocardiogram) utilizes ultrasound waves to evaluate the heart. The size and thickness of each heart chamber can be evaluated, and the effectiveness of the heart’s contractions can be directly observed. 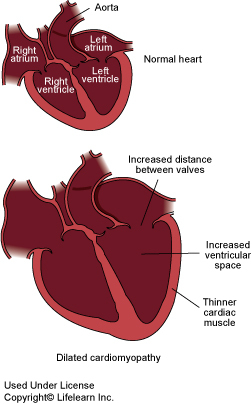 Measurements can be taken to evaluate the heart’s pumping efficiency. Can’t you treat my dog without these tests? Accurate diagnosis gives us a much better guide to the type and extent of treatment necessary. Today there is a wide selection of heart medications that can be used to treat congestive heart failure and treatment regimes must be tailored for each patient. Without these tests, your veterinarian is unable to determine the optimal treatment for your pet, and may inadvertently cause more harm than good. With proper treatment, many dogs are able to live a normal life for many months to years. This entry was posted in News, Tips & advice and tagged canine, dogs. Bookmark the permalink.